Editor's note: There will not be a detailed sales chart for the month of June as staff at the Automotive News Data Center in Detroit observe Independence Day. Canadian new vehicles sales fell for the fourth consecutive month in June, down 1.6 per cent compared to last year, but the head of the Global Automakers of Canada said sales remain strong in the face of economic uncertainty. Automakers sold 200,156 new vehicles, according to the Global Automakers of Canada. Sales through the first half of the year now stand at 1,036,678 units, down 0.2 per cent from 2017, which ended up being a record year. Ford, which saw its sales dip 4.8 per cent still managed to sell the most vehicles in June and retained the overall sales lead in Canada through the first half with 160,288 units sold. “The June results don’t rule out the possibility of another record year for auto sales in Canada,” GAC President David Adams said in a statement, “but there are some significant headwinds, not the least of which are the steel and aluminum tariffs imposed by the Trump administration and the possibility of 25 per cent tariffs on vehicles imported into the United States. Once again, the Ford F series and Honda Civic reprised their roles as the best-selling vehicle and passenger car, respectively. Trucks comprised 69.4 per cent of the market in June compared to 67.3 per cent last year. Through the first half of 2018, truck sales accounted for 70.2 per cent of all sales compared to 67.3 per cent last year. As several automakers posted record June numbers, FCA and Ford dragged the total sales number. FCA sales were down 17 per cent to 22,479 while Ford saw its sales slip 4.8 per cent to 31,193 vehicles in June. Nissan Canada had not only its best June but its best month on record with total sales of 16,330 vehicles in June, an increase of two per cent. 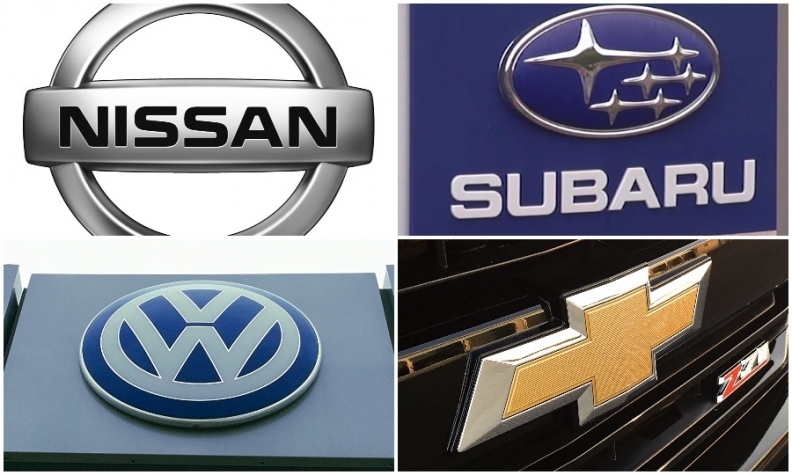 The Nissan and luxury Infiniti brands each had their best sales month ever on their own. The Nissan division sold 14,932 units in June, an increase of 0.9 per cent year-over-year. The Infiniti division sold 1,398 vehicles, an increase of 16.3 per cent. Nissan’s best-selling vehicle in Canada, the Rogue, had sales of 4,342 vehicles while the smaller Nissan Qashqai saw 2,150 vehicles sold, a new monthly record as it continued to be the second best-selling model in the Nissan lineup. The all-new 2018 Nissan Leaf electric vehicle set a June sales record with 492 units sold. The all-new 2018 Nissan Kicks compact crossover had sales of 609 in its first full month of being available. General Motors Canada sold 27,638 vehicles in June, a 1.8-per-cent increase over last year and its best June total since 2011. Broken down, GM Canada had retail sales of 21,259 vehicles and 6,379 fleet deliveries. With June’s sales, the company has now delivered 154,937 vehicles in the first half of 2018, an increase of three per cent in total sales year-to-date, its best first half of a calendar year in 10 years. GM Canada managed to sell 679 Chevrolet Malibu sedans — an increase of 14.5 per cent – even as Canadians continue to shift to trucks. However, Impala sales slipped 19.2 per cent to 219 vehicles. Chevy also suffered a sales slump when it came to the Canada-made Equinox, which saw sales plummet 22 per cent to 1,799 units. Sales of the full-size Chevy Silverado and mid-size GMC Canyon were up 7.9 and 4.3 per cent to 5,792 and 607 units, respectively. GMC Sierra sales were down 3.7 per cent to 5,564 units. Spark sales surged to 782 units in June while Bolt sales were 81.1 per cent to 306. Subaru Canada reported its best June on record, selling 5,348 units, a 5.1-per-cent increase over the same month last year, according to the company. The Crosstrek compact SUV, the automaker’s most popular vehicle in Canada, had its best June with 1,410 units sold, an increase of 63.6 per cent over 2017. Outback, and its rally-bred WRX and WRX STI sport sedans, saw sales increase by 13.9 per cent and 4.9 per cent, respectively. Every region across Canada posted stronger results than the same month last year, Subaru said. “Our sales momentum is stronger than ever,” Subaru Canada CEO Yasushi Enami said in a statement. Volkswagen Canada, which doesn’t publicly break down sales by model, said it sold 6,828 VW brand vehicles, posting its best June on record, and a three per cent increase over the same month last year. Toyota Canada saw its sales dip 0.6 per cent in June as the automaker sold 23,289 vehicles. The Toyota division reported sales of 20,833 units, down 1.1 per cent compared to last year, while the luxury Lexus division reported record June sales of 2,456 units, up 3.5 per cent compared to June 2017. Canadians gravitated toward Toyota’s electrified and hybrid vehicles. Total sales of hybrid vehicles hit 2,496 units, up 5.5 per cent for a new June record. Prius sales of 685 units, including Prius Prime, were up 28.3 per cent. Meanwhile, RAV4 hybrid sales of 727 units marked a 12 per cent increase and new June record. The Canada-made Lexus RX and the Lexus NX helped boost the luxury brand to a new monthly record, with 983 RX units sold — up 18.1 per cent — and 824 NX units sold —up 17.9 per cent — compared to last June. Ford Canada saw sales slip 4.8 per cent to 31,193 vehicles in June with cars taking a beating, down 23.4 per cent to 3,947 units. Even the automaker’s truck sales were down 1.4 per cent to 27,246 units. Some vehicles on their own had a solid month. Escape sales were up seven per cent to 5,101 units while the relatively new EcoSport had its best month with sales of 738 units. But, the popular F series truck saw its sales drop to 13,612, a 15-per-cent increase over the 15,660 Ford sold June 2017. Fusion sedan sales plunged nearly 30 per cent to 1,018 units.